The Rev. Gottlieb Nathanael Bonwetsch was born February 7, 1848 in Norka, the son of Pastor Christoph Heinrich Bonwetsch who was serving in Norka at the time, and Beate Christiana Friederich. He married in the colony of Grimm to Lydia Deggeller on December 15, 1883. She was born in Karras in the province of Stavropol on March 5, 1861 and died in Göttingen on January 4, 1939. She was the daughter of Pastor Bernhard Deggeller and Elisabeth Lang. From 1859 to 1865, he attended high school and college in Reval (now Tallinn, Estonia). He was a theology student at the seminary in Dorpat, Estonia (now Tartu) from 1866 to 1870. He was ordained in Moscow on February 7, 1871. From 1871 to 1874 he served as the assistant to the dean of the Bergseite colonies. He received further theological education in Göttingen, Germany in 1874-1875. He served then from 1875 to 1877 as the assistant pastor to his father in Norka. He returned to Germany again, this time to Bonn, for further education in 1877-1878. 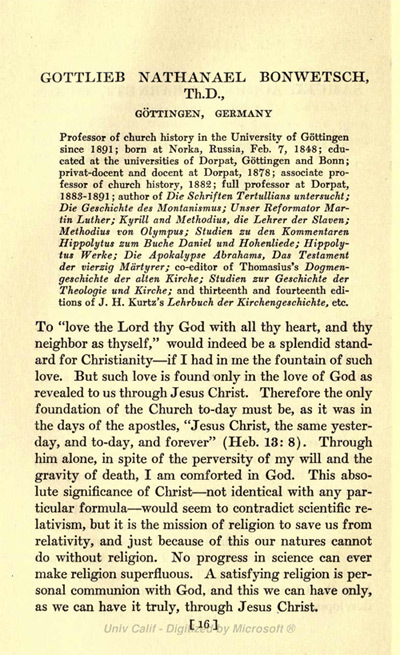 On April 8, 1878, he became a professor of church history at the seminary in Dorpat. He earned a doctorate in theology on November 2, 1881 and tenured professor on October 3, 1883. He served on the Göttingen City Council from 1891 to 1921, retaining an emeritus professorship in church history. Gottlieb Nathanael Bonwetsch died in Göttingen on July 18, 1925. The son of Rev. 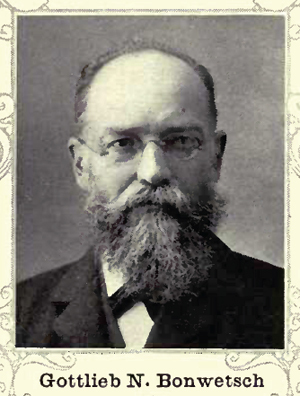 Gottlieb Nathanael Bonwetsch, Dr. Gerhard Bonwetsch, is the author of Geschichte der deutschen Kolonien an der Wolga (The History of the German Colonies on the Volga) published in Stuttgart in 1919. The book was dedicated to his father on his 70th birthday. Dr. Gerhard Bonwetsch states that his father's was born on February 17, 1848 in Norka on the Bergseite of the Volga. 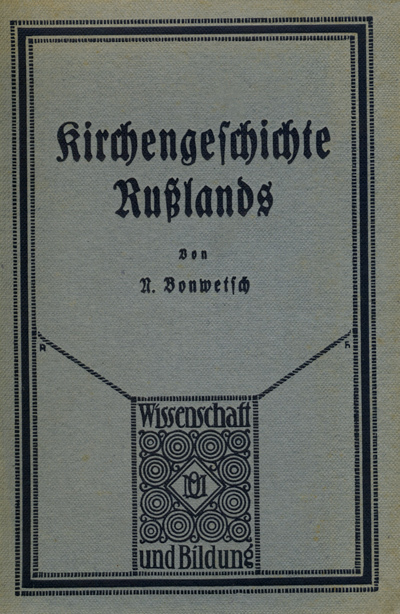 Cover of the book titled "Kirchengeschichte Russlands" by Gottlieb N. Bonwetsch from Norka. This book is available for use at The Center for Volga German Studies at Concordia University. 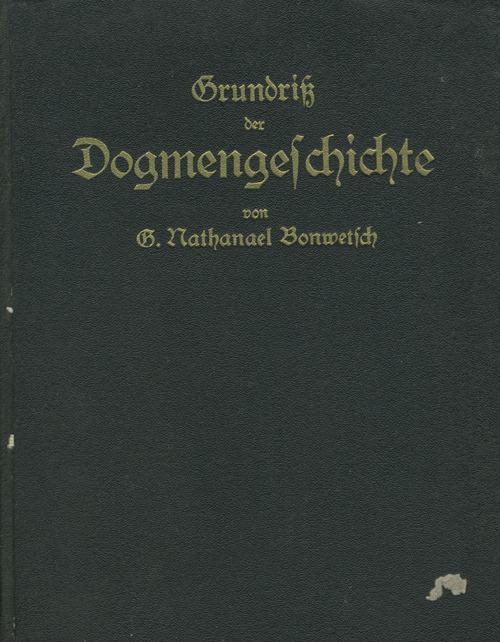 Cover of the book "Grundriss der Dogmengeschichte" by Gottlieb N. Bonwetsch from Norka. This book is available for use at The Center for Volga German Studies at Concordia University. Amburger, Erik. Die Pastoren Der Evangelischen Kirchen Russlands Vom Ende Des 16. Jahrhunderts Bis 1937: Ein Biographisches Lexikon. Lüneburg: Inst. Nordostdt. Kulturwerk, 1998. 269. Print. Schnurr, Joseph. Die Kirchen Und Das Religiöse Leben Der Rußlanddeutschen. Stuttgart: AER-Verl., 1978. 127. Print. Scott, Robert, George William Gilmore, and Clarence Augustine Beckwith. The Church, the People, and the Age. New York: Funk & Wagnalls, 1914. Print. ​Hasselblatt, Arnold. Album academicum of the Imperial University of Dorpat. Tartu: 1889.